A bitone beauty that is sure to become a landscape favorite! Best Bet is a reliable rebloomer that yields plenty of flower-filled stems per healthy plant. Highly attractive porcelain-blue standards are wonderfully set off by deep blue, ruffled falls-a very showy color combination. 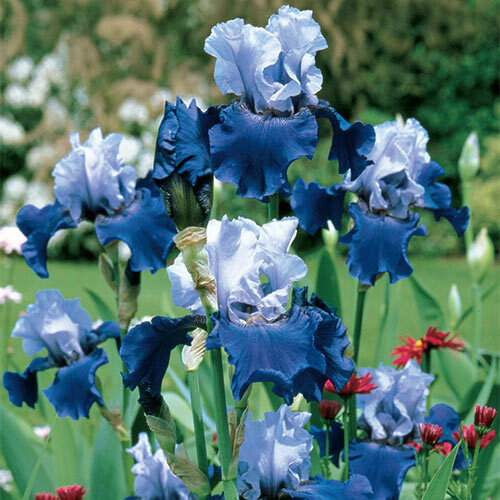 Site in a sun-filled border or cutting garden for best bloom production in mid spring, with a second round of flowers appearing in late summer to early fall. Because of its floriferous growth habit, Best Bet is perfect for those who like to create indoor floral arrangements and deliver lush bouquets to family and friends. Carefree and easy to grow, this variety is tolerant of many soil types. Deer won't bother iris.